Colored jeans are making a scene! This year there is a fad traveling around the world, and more locally, here at Lipscomb: colored jeans. Now, when you first hear about this trend you may be skeptical just as I was, but if you give these vibrant pants a shot, you will see that they are a great snag for your closet! I saw these pants first in a fashion magazine a couple years ago and wondered if customers would ever become brave enough to flaunt them, but surely enough soon after I began to see girls and guys alike wearing colored denim. Here on the LU campus, I notice these jeans more on girls. Popular colors for the colder seasons are dark green, bright blue, red and black. However, as the weather has gotten warmer I have noticed more pastel colors and also white. Colored jeans are great because they can be worn with anything in your closet. If you want to go casual, throw on a pair with a T-shirt or sweater and a pair of sandals, boots or Converse. If you are wanting to dress a pair of these fun pants up for a night out, try pairing them with a nice top and heels and maybe add a blazer if the weather calls for one. Personally, I own only one pair of colored jeans and they are red, but I definitely will be keeping my eye out for some new ones to wear this spring. When I purchased them several months ago, I was wondering if I would ever actually wear them since they were such a strong fashion statement. Needless to say, they may very well be my favorite pants now! Me and my own pair of colored jeans. They were on sale at Urban Outfitters for only $30. They add flair and personality to any outfit and are just as comfortable as any pair of jeans you already own. Like I said, I have not seen many guys wearing colored jeans around campus so far, but I think they can work just as well for them. If you are a guy and not into the bright colors, maybe try a darker color for less of a statement if you still want to add some excitement to your wardrobe. 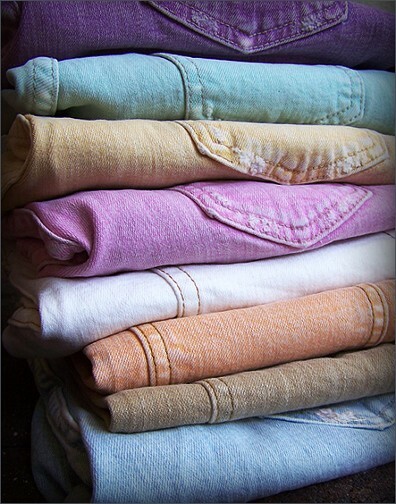 Colored denim jeans can be bought for a low price at stores such as Forever 21, Target and Urban Oufitters. I love this fashion trend and encourage everyone to try it! Lastly, a tip for new owners: Do not wash your new red jeans with the rest of your white laundry. Although my favorite color is pink, I wish my socks were still white. Oops!